Getting the SEO result that you have dreamt for your website is one of the happiest and amazing moments for any marketers. Though, it surely needs a lot of time and efforts. There are lots of SEO analysis tools found online, some free and some paid, which have made our task easier to find the bottlenecks of the website the way Google sees it. With the right tool in hand, anyone can work smartest and fastest. Your website should fulfil all the guidelines provided by Google and provide better user experience in your niche in order to reach the top of SERPS. In today’s digital world, if you want to stay forward then you need to beat all you competitors and set a goal which is far ahead of your competitors’ plan and strategy. Fortunately, there are tonnes of free tools available online that can help you achieve that goal. Here’s a collection of my top 19 online SEO tools which are fast, easy-to-use and free of cost. Google Search Console, previously called “Google Webmaster Tools” is a free service provide by Google which helps you to learn about your website and the people who visit it. It provides data and configuration control for your site in Google. With the help of this great tool, you can find out how many people are visiting your website and how they are finding it, whether the people are browsing your website through the mobile devices or through the desktop, the most visited and popular pages in your website. Google Search Console also helps to find and fix site errors, submit the sitemap, fix sitemap errors and create and fix the robots.txt file. 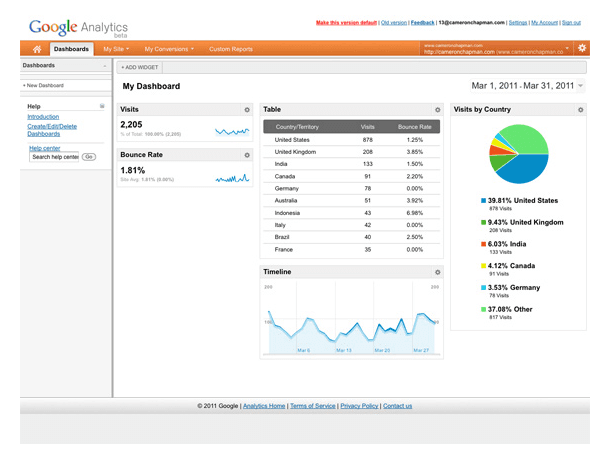 Google Analytics is another free service offered by Google. It is a powerful web application, which helps you to track and report the traffic patterns on a website. You can find out how many people visited your website, compare the number of visitors each day, locations of your visitors, what kind of websites are sending traffic to your website, the most popular pages and most liked blog content of your website, marketing tactics that drive the most traffic to your website and the number of visitors that you have converted it to leads or customers, how can you improve your site speed and many more. Analytics has recently released its new version, Analytics 5, which has a new feature of adding custom dashboards. You can simply create custom dashboards for your site and add you’re interesting metrics. You also have the option to choose how the information is displayed (table, chart, etc.). Moz Pro offers a collection of tools which helps subscribers identify SEO opportunities, track growth and leads, build reports, perform optimisation and hence, increase business’ search rankings. It has a free trial of 30 days and then paid plans starts from $99/month to $599/month. The collection of tools of Moz Pro includes tools such as the rank tracker, on-page grader, keyword difficulty, crawl test, spam analysis, compare link metrics, top pages, linking domains, anchor texts, https crawling, advanced reports, link opportunities, Mozscape link index updates, etc. This tool simply makes it easy for users to get advanced metrics, access to tops tools and all website information all in one place. Isn’t it great? Google Keyword Planner is a free Adwords tool to find the target keywords. It has an entire suite of features to identify a keyword’s growing popularity, filter outs low volume searches and high volume searches and creates hundreds of keywords recommendations in seconds. With the help of this tool, you can find out almost all information about the keywords popular in your business niche and will work best for your business. According to guys from Techie Ride, their success goes to keyword research and most part has to do with Google Keyword Planner. Google trends is a web facility provided by Google, which allows you to compare the popularity of latest search terms and trends. Google trends show the most entered search terms to the total search volume across various regions of the world with different languages. With the help of Google Trends, marketers can learn the nature of their audience, competitors highly entered queries or keywords and get content ideas from it. You can simply master the online trends with this tool and of course at free of cost. As running your business online gets more demanding, getting your product in front of the target audience has been the main course of the journey. One of the vital components of digital marketing is influencer targeting. This is where this sleek tool called Ninja Outreach comes handy. You can find multiple guest post opportunity and streamline your outreach process with this one single tool. If you are starting a link building campaign, Ninja Outreach should be kept inside your arsenal. PageSpeed Insight by Google Developers is the best tool to measure the performance of a web page for both mobile devices and desktop devices. PageSpeed Insights fetches URL twice, once with the mobile user-agent and next with the desktop user-agent. It analyses the overall site and provides the score from 0-100 depending on the performance of the site. The higher the score, the better is the site performing. PageSpeed also provides necessary recommendations to improve the site speed. Designed specifically for SEO, the Screaming Frog SEO Spider is a lite and flexible website crawler which allows you to crawl websites’ links, images, CSS, scripts, and apps in order to evaluate onsite SEO. Uses include find broken links, analyse page titles & meta-data, extract data with XPath, generate XML Sitemap, audit redirects, discover duplicate content, review robots and directives and integrate with Google Analytics. You can download this desktop program free and easily install it on your PC, Mac or Linux and fetch key onsite elements to analyse onsite SEO. In order to use all features, you have to purchase the license and use the paid version at £149.00/year. Woorank is one of the best SEO analysis tools and my all time favourite tool. The simplicity, in-depth site analysis and the recommendation approach of Woorank make marketers use this tool and carry on the optimisation and improvement of the site. It is the premium in nature and there are three available plans: Pro plan ($49/month), Premium plan ($149/month) and Enterprise plan ($249/month). However, you can also use the 14-days free trial and then decide whether to upgrade your account to premium or not. SEO Quake Toolbar is a powerful SEO toolbox, which conducts on-page SEO audit within a second, examines internal and external links, compares domains and URLs in real time and exports all data into a file. It gives quick and easy access to analytical data on any web page. SEO plugin is free of cost and is compatible with Mozilla Firefox, Google Chrome, and Opera. Keyword tool is the best alternative to Google Adwords Keyword planner and other keyword research tools. It helps marketers to find the highly searched key terms in Google Search Box. This free keyword research tool uses Google Autocomplete and generates up to +750 relevant long tail keyword suggestions for each search term. You can use this keyword tool directly without creating any account for free. Unlike other tools, this tool works 99.99% of the time and that’s the reason why it is called extremely reliable and used by most of the marketers. Xenu Link Sleuth is a free application that checks whether a website has broken links or not. It is a simple, yet efficient way to check all the links on the website. Xenu Link Sleuth checks the links on the website automatically, performs customised analysis and also generates HTML report. You can simply download this great free broken link checker and install it on your Windows PC. SEO Site Checkup is a free SEO analysis tool, which provides simple, professional quality SEO analysis and critical SEO monitoring for websites. The analysis of sites is done using 45 individual checks in 6 different categories. SEO Site Checkup not only analyse SEO issues, it also performs professional SEO monitoring, performs side-by-side SEO comparisons of up to 5 competitors and quickly creates editable SEO reports both for your clients and partners. This free link checker tool crawls through a web page and looks for broken links. Check my links checks all internal and external links on your website one by one and highlights which ones are valid and which ones are broken. This broken link checker has also made it easier for the editors to make corrections before a page is live. Check My Links highlights the valid links with green and broken links in red as shown in above. Website Grader is a free online tool released by HubSpot in 2007. This free online SEO tool was designed to give companies a comprehensive overview of their inbound marketing strategy. It takes account of the website traffic, gets an ability in search engines, the blogosphere, social media and inbound marketing factors of a website. You can simply enter your website URL and email address to get started. Site Auditor is one of the tools provided by Raven tools, which performs a quick analysis of site to find out all desktop and mobile SEO issues which may be the reason your site is ranking low in the search engine. It is compatible with phones, tablets and PCs and works with the motto Find, Fixes and Rank, just simple as that. Search Engine Optimisation is not an easy task. It needs a lot of research, time and effort. And the SEO tools like mentioned above has made it easier for the marketer like us to find out the optimisation and improvement opportunities within few seconds. By leveraging the SEO best practices and utilising the SEO tools like above the most, you can easily improve the performance of your site from each sector and increase the chances of ranking higher in search engines like Google.